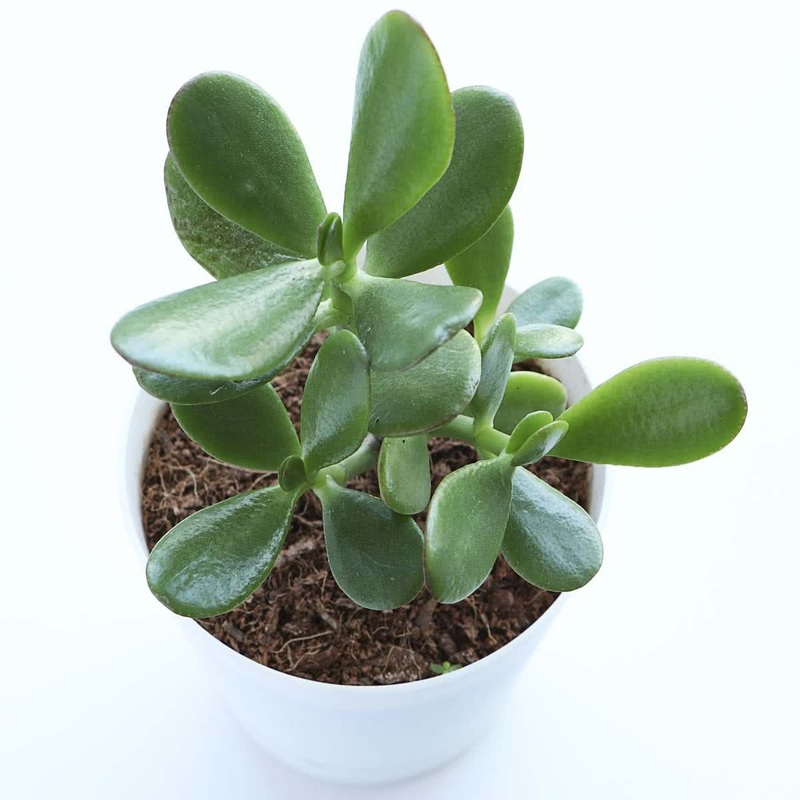 Plant Description: Jade Green is an attractive & handsome succulent shrub with evergreen, glossy, fleshy, round leaves. 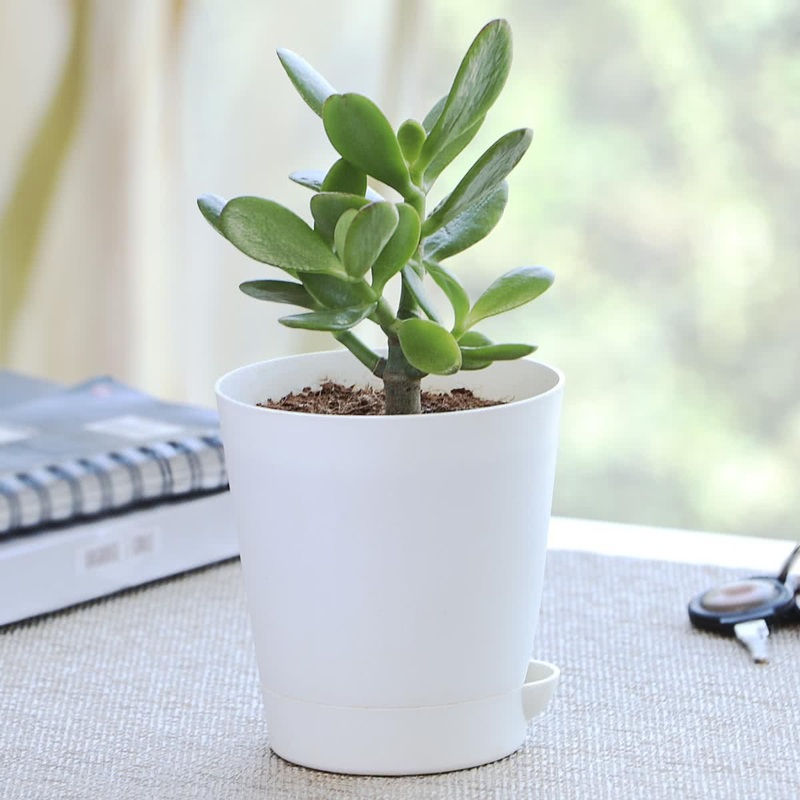 It is suitable for indoor plantations in living rooms, study room, and near windows. Jade Green is potted in fancy ornamental containers. It is also used in tabletop gardening, dish gardens & tray landscapes. Older plants are suitable for making Bonsai. Average Landscape Size: Jade Green can gain up to 2-3 ft height with a bushy growth. Special Feature: Jade Green is said to bring good luck and prosperity in the house. It is a salt tolerant plant. Soil: Use a well drained commercial potting soil mixed equally with sharp builder sand, and a scoop of bone meal added. Potting/Transplanting: The container selected must have proper drainage holes. To prevent water logging, cover the drainage holes with broken pieces of earthen pots or brick pieces before putting the soil. Transplant the Jade Green sapling in a pot along with root-ball of original soil. Carefully place the plant in the middle of the pot & cover the roots completely with remaining soil. Repotting: Jade Green should be repotted every two to three years. Sunlight: Jade Green can grow well in bright sunlight as well as low light conditions. If the plant is accustomed to dimmer light, you must move it into the sun in stages. Jade Green will sunburn if it is not used to full sun. Water: During the spring and summer months keep the soil slightly moist . Water liberally, approximately once per week but allow for slight drying between watering. Remove any excess water from pot saucer. Keep plant dry during the winter months as plant has a slight dormancy. Fertiliser: Fertilize with a 10-20-10 or 5-10-5 ratio soluble plant food every two weeks. Do not fertilize in winters. Temperature: Jade Green is best grown between 55F at night and 75-80F during the day, however it will tolerate temperatures down to 40F. 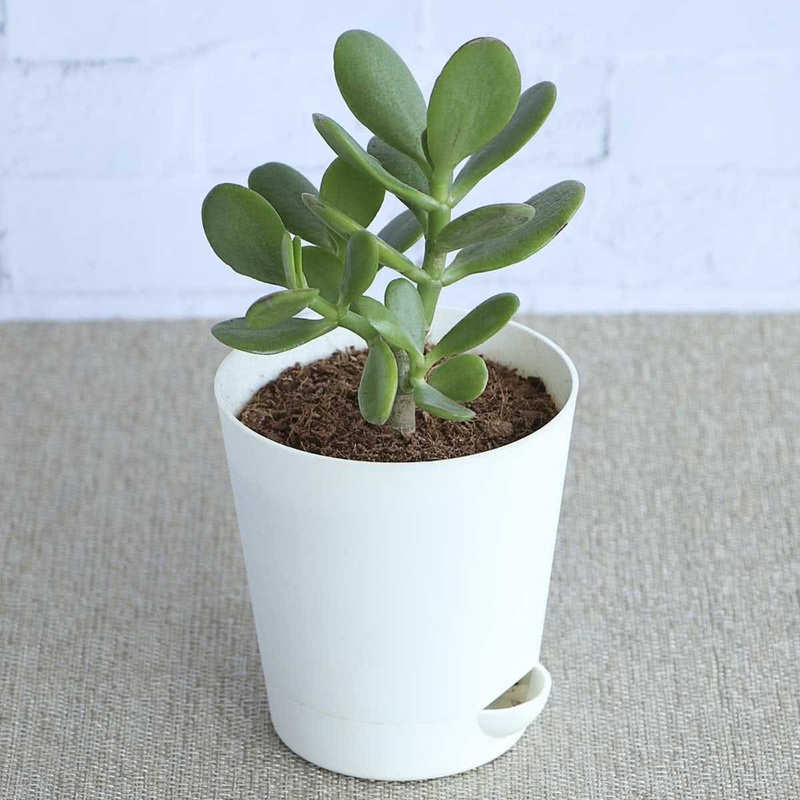 Humidity: Jade Green prefers dry climate will low humidity. Pruning: Cut short the branches every year to keep the plant in shape. Propagation: Propagate Jade Green by stem cutting. Companion Plants: Ferns, Rhoeo, Ribbon Grass, Ixora, Dieffenbachia.